Late fall is an exciting time as the holiday season gets underway. For many people, this inspiring time of year compels a sense of generosity. And for many local charities, this can translate into an avalanche of donations. While the spirit of giving may come from a genuine place of wanting to help others in need, not all donations, as it turns out, are helpful. We reached out to a few Bangor area nonprofits to find out exactly what they need from volunteers and donations in order to thrive during the harsh Maine winter. So before you drop off that bag of old clothes or bulk cans of sardines, be sure to check out this wish list from seven local charities. 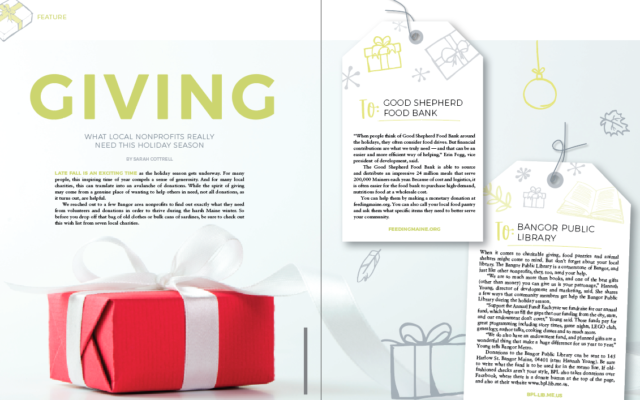 “When people think of Good Shepherd Food Bank around the holidays, they often consider food drives. But financial contributions are what we truly need — and that can be an easier and more efficient way of helping,” Erin Fogg, vice president of development, said. The Good Shepherd Food Bank is able to source and distribute an impressive 24 million meals that serve 200,000 Mainers each year. Because of cost and logistics, it is often easier for the food bank to purchase high-demand, nutritious food at a wholesale cost. You can help them by making a monetary donation at feedingmaine.org. You can also call your local food pantry and ask them what specific items they need to better serve your community. When it comes to charitable giving, food pantries and animal shelters might come to mind. But don’t forget about your local library. The Bangor Public Library is a cornerstone of Bangor, and just like other nonprofits, they, too, need your help. “We are so much more than books, and one of the best gifts (other than money) you can give us is your patronage,” Hannah Young, director of development and marketing, said. She shares a few ways that community members get help the Bangor Public Library during the holiday season. “Support the Annual Fund! Each year we fundraise for our annual fund, which helps us fill the gaps that our funding from the city, state, and our endowment don’t cover,” Young said. Those funds pay for great programming including story times, game nights, LEGO club, genealogy, author talks, cooking classes and so much more. “We do also have an endowment fund, and planned gifts are a wonderful thing that make a huge difference for us year to year,” Young tells Bangor Metro. Donations to the Bangor Public Library can be sent to 145 Harlow St. Bangor Maine, 04401 (attn: Hannah Young). Be sure to write what the fund is to be used for in the memo line. If old-fashioned checks aren’t your style, BPL also takes donations over Facebook, where there is a donate button at the top of the page, and also at their website www.bpl.lib.me.us. Who doesn’t want to help our most vulnerable furry friends this time of year? If your heart is set on making sure that pets up for adoption get some much-needed love and attention, then donating to the Bangor Humane Society might be the best option for you. The organization relies heavily on in-kind donations such as wet food, toys and bedding. They even have a wish list posted online at www.bangorhumane.org/wishlist for folks who want to help but aren’t sure what to donate. “Since we do not receive any state or federal funding or funds from national animal welfare organizations, 60 percent of our revenue comes from local donations and grants,” Stacey R. Coventry, director of development and public relations for the Bangor Humane Society, says. To learn more about how to donate online, become a kennel sponsor, leave a legacy gift, join their annual Paws on Parade event, make a gift to our Second Chance Fund (which is specifically earmarked for veterinary care) or to become a volunteer or foster parent, visit the “Support” tab on their website www.bangorhumane.org. Many kids in Greater Bangor call the Maine Discovery Museum a second home because of how much fun their educational programming is. For those wanting to donate time, funds or goods to the museum, the nonprofit has made it incredibly easy with a wish list of materials that kids use every day. This includes glue sticks, gallon-sized washable liquid Elmer’s glue, beads and buttons, markers, kids character Band-Aids, gift certificates to Lowes and Home Depot, cleaning sponges by Scrub-It in assorted colors, 2-liter hand sanitizer bottles with pumps and Clorox Disinfecting Antibacterial Wipes. To learn more about donating materials and supplies, volunteer opportunities, or helping to fund the museum through charitable donations through their Annual Fund, please visit www.mainediscoverymuseum.org. The holiday season can be particularly tough on our most vulnerable populations, which includes senior citizens. That’s why the Eastern Area Agency on Aging works so diligently to make sure that donations and volunteers are utilized in the most meaningful and efficient ways possible. If you want to volunteer, consider the Meals on Wheels program, which is the agency’s No. 1 program in most need of helping hands. If you can deliver meals to people’s homes, then they want to hear from you at unitedwayem.galaxydigital.com/need/detail/?need_id=371072. They also need help filling volunteer roles for their EX Fix Program, which is a popular minor home repair and cleaning service, and Furry Friends programs. Community members can help support these two programs by donating dog and cat food, liter to help keep the animals in the Furry Friends program happy and healthy. The Meals on Wheels program, in particular, needs monetary donations to help fulfill the requests for food services. For some folks looking to volunteer their time and skills, there are other equally profound ways to get involved in your community to make a difference. Consider joining the Literacy Volunteers of Bangor, and help someone to develop the gift of literacy. Executive Director of Literacy Volunteers of Bangor Mary Lyons explains that the nonprofit needs volunteer tutors. “Our Tutor Training is in the fall and spring. Interested people can be added to our list, and we can contact them when the training is scheduled. Additionally, we are always willing to talk with people about how their skills set could help support this mission,” she says. The group is also looking for gently used children’s books (for all ages) and cash donations. If you want to help, the best way to reach out is by called 207-947-8451 or visiting www.LVBangor.org or their Facebook page, www.facebook.com/LVBangor. The Ronald McDonald House Charities of Maine serves families from all walks of life who come from Maine and New Hampshire and beyond to access medical care in Greater Bangor and Greater Portland. Families who need a place to sleep and eat while dealing with medical care can lean on the 11 staff members and more than 350 active volunteers throughout the state to be comfortable, safe and stress-free. But they always need more help, which is where you can help. To volunteer or donate, visit their website rmhcmaine.org/volunteer. The holiday season is a magical and wonderful time of year for many reasons but the spark of inspiration to reach out and help those in need around us is, by far, the most magical part of all. Happy holidays.